We offer a selection of larder cupboards made in any size to suit your requirements, they have a generous amount of storage space with full depth adjustable shelving. Hand crafted from solid knot free pine and finished in our workshops in a colour of your choice, special sizes are available on request. 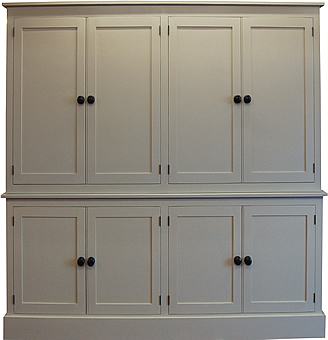 Pictured left is the most popular style four door larder cupboard with shaker panel doors, it is also available with Edwardian or Victorian panel doors, see below for details. 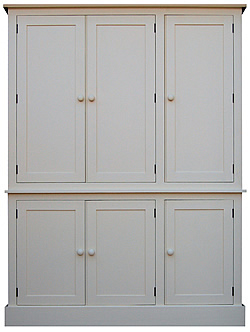 The six and eight door cupboards have separate top and bottom sections. 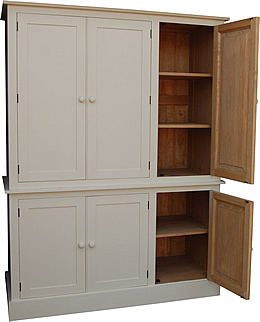 The larder cupboard comes complete with adjustable shelving, two shelves in the top and one in the bottom. 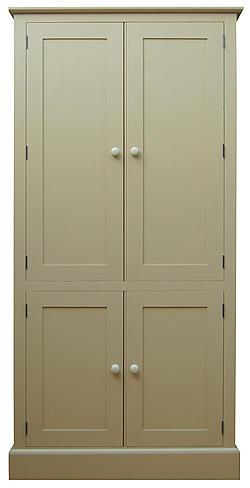 Pictured above is the six door larder cupboard showing the internal shelves and interior finish, below is the eight door larder cupboard.